In each generation, there are the must read books in grade school, despite the fact such literature may not be appropriate for the children vying after it. Today’s youth fight over The Hunger Games, The Divergent Series, and the John Green novels The Fault in Our Stars or Looking for Alaska. If you are a fellow millennial this is pretty amusing because what did we fight over in elementary school? 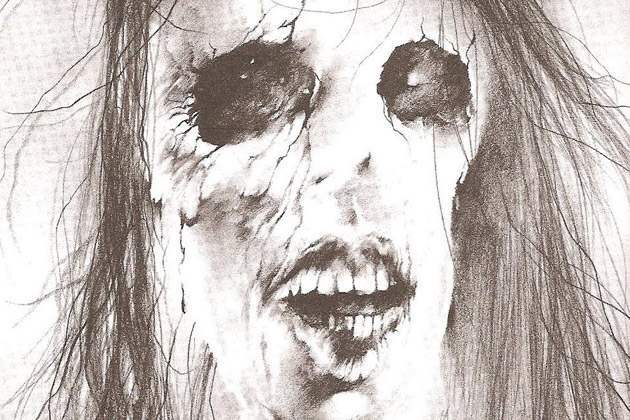 Oh, yeah, that’s right, that really f-ed up series Scary Stories to Tell in the Dark. Nestled in the same library as Nancy Drew, the Pokémon novels, and I-Spy. These books ranked some of the most checked out in schools across the country in the 90s and early 2000s which claimed to be appropriate for ages 9 and up. AND, some of the stories were even featured in The Reading Rainbow Readers Series! If you have read any of the three in the series, there is always one story that sticks with you. In fact, I have asked others haunted by these books and they can usually recite the story that haunted their dreams. The stories send chills up your spine and the accompanying drawings look more fit for a Horror Con than a children’s book. 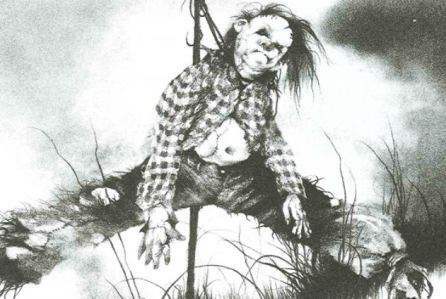 However, as I reflected on my experiences with the Scary Stories series I began to wonder, why was this allowed in schools? Are the sick author and mad illustrator degenerates who love to terrorize children in their spare time? Am I the only one who has questioned the fact that these books are in the hands of children? But most importantly are they even allowed in school still? When I actually got my hands dirty, what I uncovered is actually quite fascinating. First off, the author Alvin Schwartz and illustrator Stephen Gimmell had already worked in the arena of children’s literature for some time before the conception of these books. But what they had previously worked on wasn’t anything like the Scary Stories to Tell in the Dark Series. Gimmell was an artist for picture books with cute stories while Schwartz was an accomplished author that wrote about folktales and superstitions that were kid friendly. In fact, each Scary Stories includes a preface that explains this type of storytelling has been around for years and that the tales included are just adaptions of originals dating back who knows how many years ago. The collection takes lore from several cultures and time periods and the stories themselves are pretty timeless and easy to read aloud. The books even include “stage directions” for the reader in order to basically jump scare their friends when the tension has reached a climax. Unfortunately, Schwartz passed away before his books received the enormous popularity they have today, but when Gimmell was asked about the reaction to his horrific illustrations, he responded that he found it ‘ironic’ that adults were freaked out about his pictures and he honestly thought no one would take them seriously. So, after I discovered that the author and illustrator weren’t sick or depraved, I began to research why these were even allowed in schools in the first place. Well, the first piece of evidence has been recognized; these books were the product of men who were perviously established in children’s literature. But it was Scholastic Books who actually published the series. The same people who brought you Clifford the Big Red Dog and Arthur the Aardvark decided that Scary Stories could sit on the same shelf at your child’s book fair. On the other hand, these books do offer a disclaimer saying that they are appropriate for children ages 9 and up. The more interesting aspect in this equation is that this series was seen as a collection of educational books to teach children about scary folklore. I mean, how much different is this from Aesop’s fables? The tales have multi-national origins and ‘morals’ can range from listen to your parents to accepting that there is evil in the world. When I see these books in this new light I can see a reason for including them in schools. Growing up in a mixed ethnic household I was told traditional Mexican stories, which can be severely frightening. My mom wasn’t trying to terrify me (well at least too badly) by telling me about La Llorna, she was trying to instill in me to be home before dark and a fear of strangers. Kids may not listen to their parents, but they will edge away from strangers because the boogeyman may be lurking underneath that raincoat. There were also arguments that these collections are a healthy avenue for children to be scared and learn how to deal with genuine fear and the very ugly side of our world. That seems reasonable, but then I started reading about the huge amount of controversy that has stuck to this series. Apparently, I am not the only one who has wondered if these books are child appropriate. In fact, the series has been challenged to the American Library Association for its availability to grade school children. From 1990-1999 it was the number one contested series AND from 2000-2009 it was the seventh most disputed series. So for 19 years straight it was so upsetting that it was always in the running for the attention of a board that CAN effectively take this book out of children’s hands. Seemingly, most of the people that were picketing these stories were religious fanatics that argued the series promoted Satanism and devil worship. The points used against the books were synonymous with those used against the Harry Potter series and that was a tad disappointing. I mean, if you are going to get a book banned, at least try to get it banned on its merits and not your interpretation. The Scary Stories series does not promote ‘black magic’, but runs rich with themes of cannibalism, murder, and paranormal activity. But they certainly do not promote Satanism. The books were taken out for some time in schools, but reentered after publishers released a 30th anniversary edition of the books in 2011. What they didn’t mention before the re-release was that they were going to reskin the illustrations and instead of Gimmell’s designs they used the artist from The books. Don’t get me wrong, I love The Series of Unfortunate Events novels, but the Scary Stories books look completely different and lost a lot of their terrifying charm. Buzzfeed.com actually released an article that showed the vast differences between the original and the new release…and wow the new version is completely neutered. Here is the link to the article so you can check it out for yourself. Researching all about the book series that inspired me to venture towards horror was quite rewarding. It was enthralling to read about the men behind my childhood nightmares and my disdain for the series has turned to understanding and even support for future generations to read. I even re-read them in an attempt recapture the terror I had once experienced. Now I wasn’t exactly jumping out of my skin, but I was still shaking off chills that crept down my spine. All in all, after this examination I believe that children should first experience horror in a controlled environment where the only consequences are bad dreams and runaway imaginations. There are great and terrible aspects to growing up and realizing that there is a dark side to everything that we love and cherish. So, needless to say, make sure you have this on your child’s bookshelf so you can have the conversations about strangers, fear, and the unknown. But I sincerely apologize in advance for all the sleepless nights you are going to get since your child will likely be haunted afterwards. First Poster and Teaser Trailers Drop for Scary Stories to Tell in the Dark!